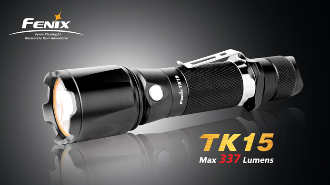 The Fenix TK15 features a powerful, tough, durable, and fully-waterproof design intended for harsh outdoor conditions. Operating on two CR123A lithium batteries or one 18650 li-ion battery, the multi-level dimmer function makes a perfect combination of extreme brightness and ultra-long runtime. The innovative side dimmer operation is very simple and easy to use.